Today's racing at Road America was way more fun! 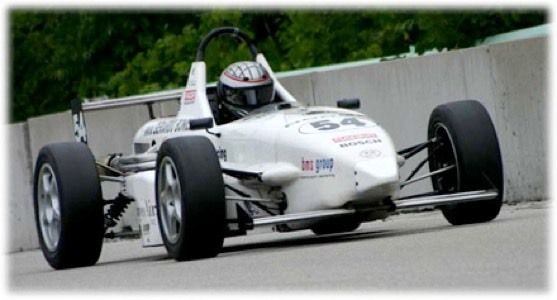 The Skip Barber National Championship presented by RACER experienced a race of warfare yesterday. Today, happily, was much more like a sport, an athletic event. Well, almost, but we'll get to that. For today's Round 12 (of 14) I was gridded 2nd. At the start I was on the power a millisecond sooner than polesitter Andy Rossetto. It helped that the 4th place car of Cole Nelson helped me with the draft. I took the lead into Turn 1, and held it for an entire lap! That must be a record. As the laps continued, we began trading positions. I went from 1st to 5th, back to 2nd, to 4th, to 3rd, to 2nd, and I think I lost count. Jordy Vorrath, Cole Nelson, Andy Rossetto and I had a great battle. That's not to say it didn't get crazy. Just ahead of me exiting Turn 7 one of my competitors fell off the road. I think it was Vorrath, but its hard to remember. He was so sideways, I was just waiting for him to fly off the road. But he held on. Later, perhaps lap 6, I had a run on Cole Nelson between the Kink (Turn 10) and Canada Corner (Turn 12). As I moved to his right to make my pass, Cole changed lanes to my lane, pushing me off into the grass on the right. The trouble was that we were still in a 5th gear left hand bend at 120 mph. In the grass, you can't really steer, so I flew into the concrete wall. Ouch!! But never fear, I've seen these cars wreck, and just knew my wreck was no big deal. Yes, really, 120mph sideswiping a concrete wall is no big deal. Honest! At the next corner the car handled funny, but I figured it was just cold tires (driving through the grass supercools the tires, which have to be re-heated over the next few corners). The car checked out, and I was back on those guys passing for 3rd place. With one lap to go, I was sitting in 4th place. Andy Rossetto was leading followed by Cole Nelson, while Jordy Vorrath was in 3rd. Jordy and I had traded positions during the last few laps, so thinking "Championship", I had a feeling if I kept Jordy busy with me, there was no way he'd win the race. As we fought on the last lap, he had a bobble in the Carousel, giving me my chance to pass between the Kink and Canada. As we tracked out of the Kink, I immediately popped to the inside to make my move. Wouldn't you just know it, as soon as I popped, he jerks right to block, hitting my left front tire with his right rear. I flew into the air (mind you, we're going 115 mph in 5th gear), my car landed, Jordy was still ahead, I was 4th, nobody was behind me, my car was reeeeally handling bad now, so I limped it home in 4th. Bang-up finish to an otherwise great race. My points lead now stands at 13. I only need to keep my focus, finish smart in the last two races, and its all gravy. It's my championship to win. Thanks again to everyone who has helped me find the way. Special thanks this weekend to Peter Argetsinger, Oswaldo Negri, Jim Pace, Steve D'Brecht, and Randy Buck for helping me to improve my performance from the first race to the second. It's mid-day Friday at Road America. We've just completed our second Qualifying session, this one for Saturday's Round 12 race in the Skip Barber National Championship presented by RACER. As the session began, we were sent on track in a way only Barry Waddell would appreciate; all cars were sent on track together with zero gap. This was so much fun because it gave me a chance to have an ego stroking first lap by passing eight cars between pit exit and Turn 5. I then found myself following Cole Nelson and Matt Varsha (3rd and 4th in the points standings). How lucky was I? As the next lap began I was already in Cole's draft. A few corners later I had passed Cole, with Matt right in front of me giving me another draft. And there it was, my first flying lap, at 2:32.378. I wasn't sure it would be enough for pole, but it was nearly perfect. I had to get away from Matt and Cole so as not to give them the same advantage they had just given me, so I decided to pit. 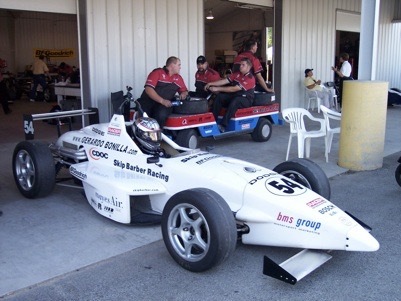 While sitting in the pit lane I learned Andy Rossetto had set a blazing 2:31.775. Excuse me? There it was, the mark had been set. I left the pits to go find what was inside me to beat Andy's time. I found myself a huge gap. But what I really wanted was a group of cars to use for drafting. When I found that group, it wasn't the great pair of drivers Matt Varsha and Cole Nelson are, so following this new group was no help. Then, in another twist of silly luck, a different car crashed, ending our session 5 minutes early. I would finished Qualifying in 2nd overall. Not bad, actually, for a single lap! Stay tuned for Round 11 race notes coming later today, and Round 12 race notes late tomorrow. Thanks again for your support and care. 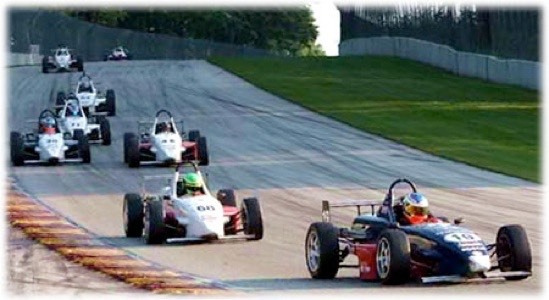 Road America Race 1 - Road Rage! 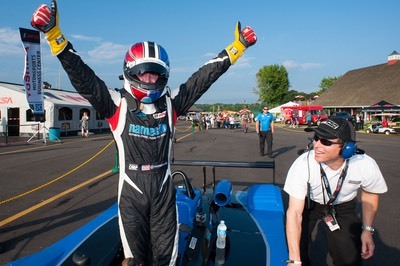 Today's race for Round 11 of the Skip Barber National Championship was hugely eventful. It was warfare. It was animalistic, as if scores of predators were after the same prey. As the championship leader, I can now tell you just what it's like to be the prey. I've never been in a situation quite like today, being the hunted, getting little to no draft help throughout the race. Road America is a track with very long straightaways, so the using the draft to maintain position is critical. When everyone is working against you, it is very difficult to maintain position. Thus the race began well, starting from 4th position I was up to 3rd place by Turn 5. Shortly thereafter I was up to 2nd, then actually led a portion of lap 3. But it wasn't to last. Andy Rossetto led a train of cars working together to get by me. How could I blame them? They know what they have to do. Over the next few laps Andy, along with Jordy Vorrath, Cole Nelson, Matt Varsha, Paul Albert and I had the most intense battle of the year. There was swerving, blocking, rubbing, wheel to wheel contact, damaged wings, noses, and a few big wrecks. We raced hard. Half way through the race I found myself side by side with Jordy Vorrath. Neither of us gave much room, and exiting Canada Corner (Turn 12) we both slid wide, causing me to fall off the road just long enough to lose three positions. I knew I'd have my work cut out trying to make up those spots. And work it was. In the end, I'd finish 6th. It certainly wasn't the finish I had hoped for, but considering the intensity of the race, I have to look at it as part of running a championship this tough, against great drivers. There are three races to go, and plenty of unanswered questions. Stay tuned for tomorrow's Round 12 update as we race once again at Road America. Pray for rain!! Thanks again for all of you who have helped me get here. Thanks also to those of you who took the time to watch in person at Turn 5. You guys were with me every lap. 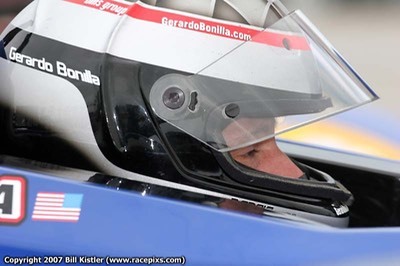 The Skip Barber National Championship presented by RACER has returned to Road America for rounds 11 and 12 of the 14 race series this Friday and Saturday in support of the American Le Mans Series. We took to the track today in three separate practice sessions, and a fourth session as Qualifying for Round 11. 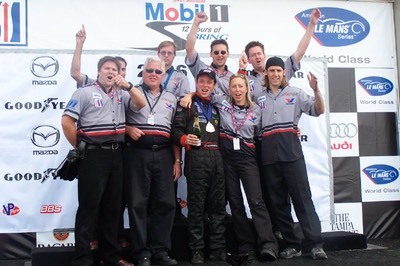 Early in the day, we served as "track cleaners" by being the first group to take to the 4-mile surface. 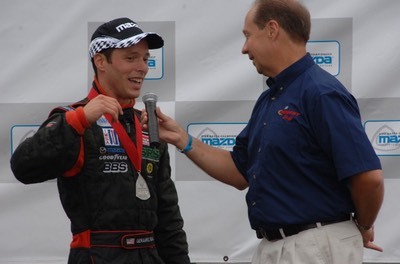 By the end of that session I found myself at the top of the time sheets, but by only hundredths over Andy Rossetto, a local hotshoe who knows Road America better than most drivers ever do. In our second session, I was singing the praises of the rain gods, as the skies opened up and soaked a perfectly good race track into a bit of a skating rink. As much as I love racing in the rain, this session was particularly tough since we went on track with brand new rain tires. It's, er, rather exciting trying to break in a set of BF Goodrich g-Force Sports on a track that's already wet!! Lets just say, I had a super great time, and finished that practice 3 full seconds ahead of P2. I made my point. Our third practice was on a mostly dry track, continuing on the g-Force Sport treads. After finding the groove, I made my run for a lap time, but instead found traffic at the most inopportune times. It didn't matter, as I was 2nd quickest despite the slowdowns. Finally, our fourth session served as Qualifying for Round 11. On a dry track, and back on the BFG slick tires, I was fortunate to be the first car on track, allowing myself to get in the zone a little sooner. I was lucky to do that, as my first flying lap was relatively quick. After a second flyer I discovered a handling problem (huge oversteer) I just had to fix. Into the pits I went for a tire pressure adjustment. No sooner did I re-enter the track did someone find a reason to crash and put a stop to our session. Back to the pits we went. As we restarted, I knew I had only about ten minutes to find a fast lap to go for Pole. Andy Rossetto had already set a blazing time, so I knew I had to dig deep. As I flew around the track on my first flyer, as I exited Turn 14 and drove over the exit curbs, my left steering clevis broke. Basically, this part connects the steering rack to the tie rod that actually turns the wheel. If it breaks, its like someone grabbing your steering wheel hard and jerking you off the road. If you were riding along, you would have been convinced you were going to crash. 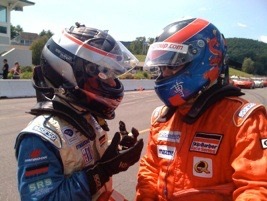 But crash we did not, and I was lucky to slow down and bring the car back to the pits. Considering I only did two quick laps, I qualified 4th for tomorrow's race. I'm still a happy driver.